In this cleverly spooky parody of Clement C. Moore’s famous Christmas poem, the witches are up to their elbows in cobwebs and slime, making sure their witchlings are well prepared for their first Halloween. 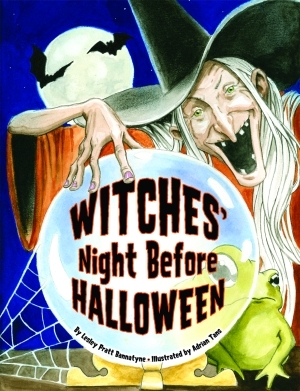 Featuring characters like Mad-Maud and Snaggle-Tooth-Ruth and plenty of ghouls, zombies, monsters, skeletons, and moldy cellars to satisfy all Halloween lovers, this good-natured book about these wickedly fun witches will have kids more amused than frightened. Author Lesley Pratt Bannatyne is a leading authority on Halloween who has shared her knowledge of the holiday on television specials for Nickelodeon and the History Channel (“The Haunted History of Halloween”), with Time Magazine, and at venues as diverse as the 2000 Halloween Convergence in New Orleans and the St. Louis Art Museum. She contributed the Halloween article to World Book Encyclopedia and is Halloween advisor to the Vampire Empire, formerly the International Count Dracula Fan Club. Her previous books with Pelican include A Halloween How-To: Costumes, Parties, Decorations, and Destinations; Halloween: An American Holiday, an American History; and A Halloween Reader: Poems, Stories, and Plays from Halloweens Past. Illustrator Adrian Tans is a painter and illustrator who has exhibited in a variety of galleries and venues. He has worked as a carpenter, ship’s cook, stay-at-home dad, five-time Vermont state snow-sculpting champ, professional coffee pourer, and photographer’s assistant. His travels have taken him from coast-to-coast and around Europe. He is also the illustrator of Kick the Cowboy, Pirate Treasure Hunt! Pirates Don't Say Please!, and The Emperor’s Army.